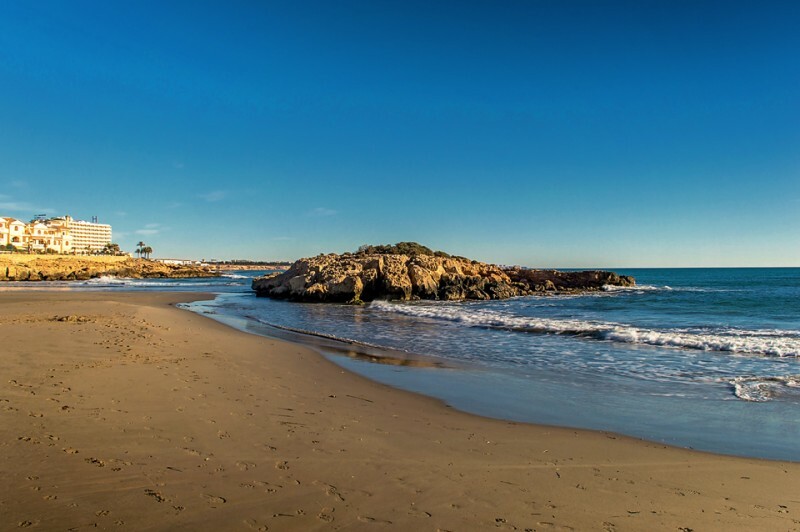 Having spent the majority of our time at the calas in Torrevieja, we decided to travel a little further south to La Zenia and walk to Cabo Roig via the coastal route. 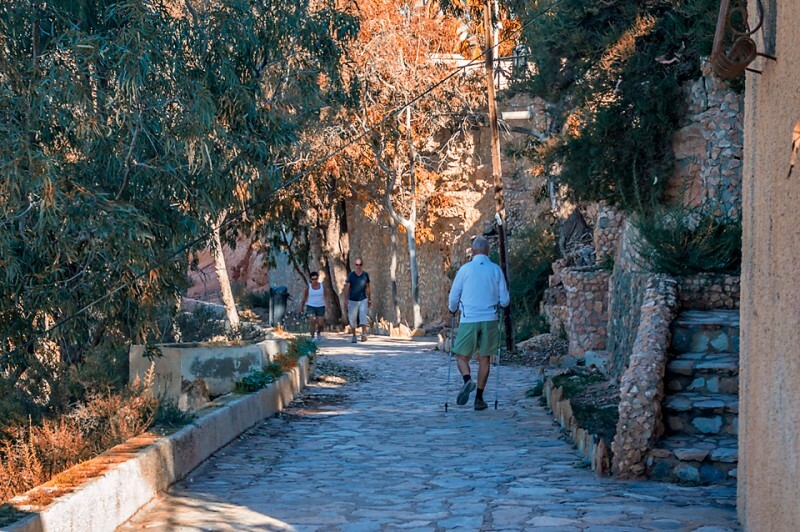 This is an easy walk and whilst on our travels we met many different people from young to old, to dog walks and joggers. As it was 8.30am we were able to park outside La Zenia Cala Bosque. 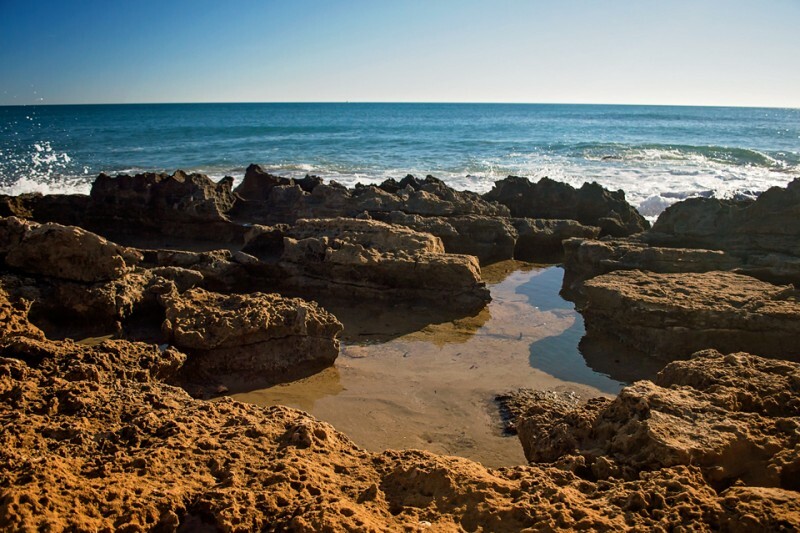 This sandy beach has been awarded a Blue Flag for high standards of quality of both the water and beach cleanliness. The beach also has a volleyball net, a rope climbing frame, and even a lookout tower. 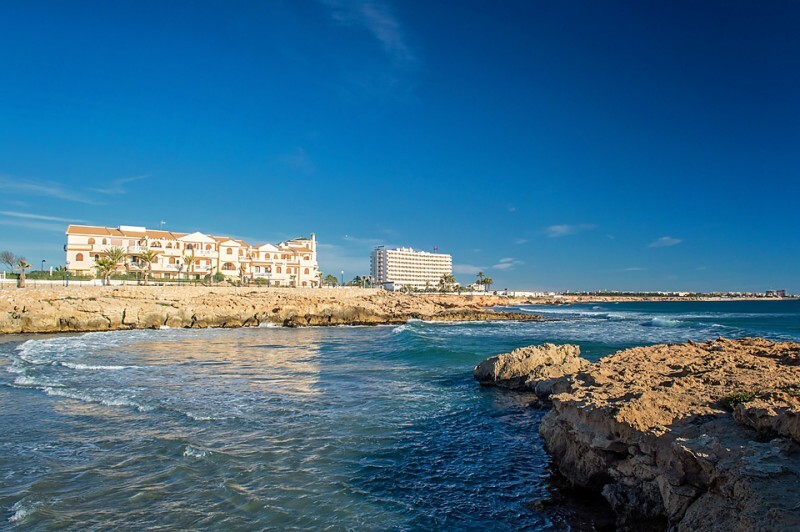 La Zenia Cala Bosque is an excellent spot for windsurf enthusiasts. 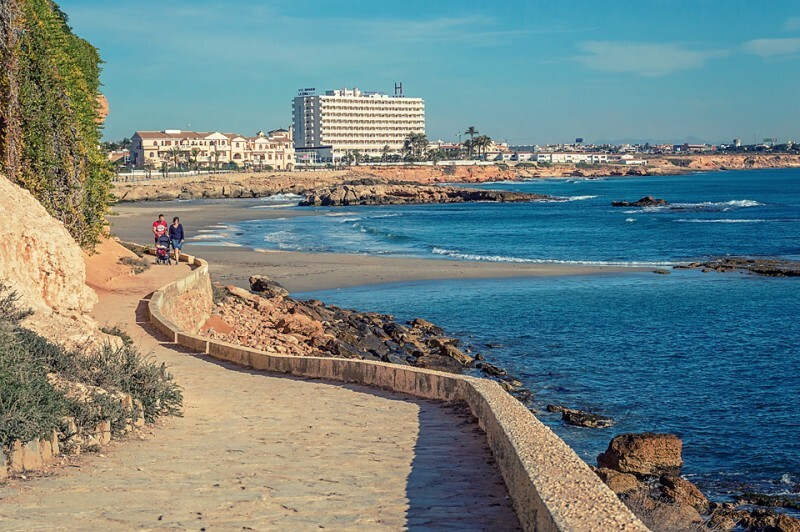 At the far end of the La Zenia Cala Bosque is a paved promenade leading round to the next bay, Playa Capitan also in La Zenia. 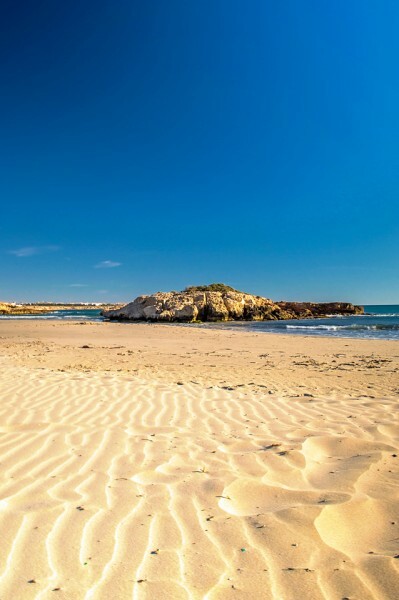 This sandy beach has a rocky island which you can easily climb onto and have a little explore. 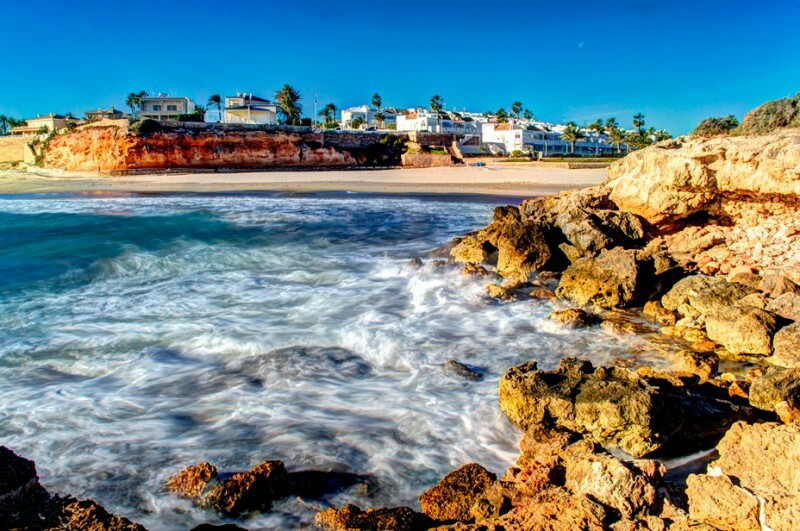 Playa Capitan is another Blue Flag beach. In the car park on the left is the Chez Felix restaurant, which was very pleasant looking from the outside. Getting back to Playa Capitan, there was decked boardwalk at the far end of the beach leading round to the next small bay. There is a pathway around the edge of the beach, however it had been closed off due to falling rocks. We were able to climb the steps onto pathway and continue our coastal walk. 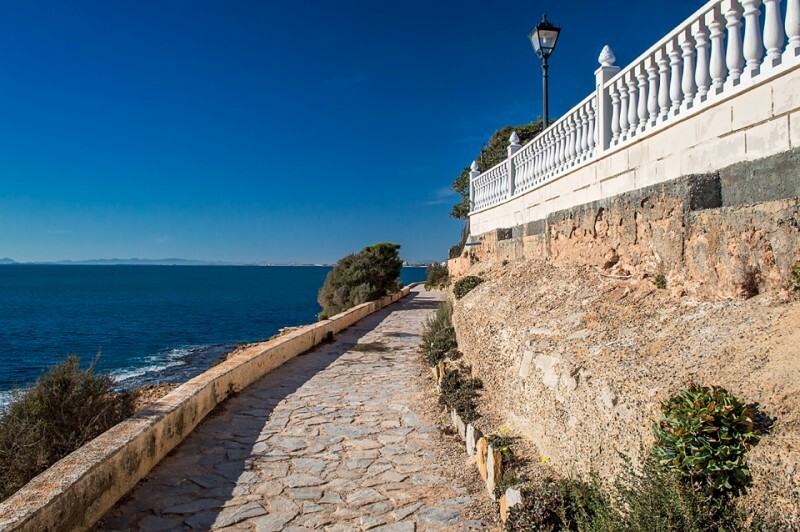 As you walk along the route towards Cabo Roig there are various steps leading to private residences. From here the sandy beach gives way to rocky coves. These coves are amazing and there are many fissures and rock formations. Watching the waves crashing into the rocks was awesome, this is a great route to stroll at a leisurely pace and take everything in. As we continued our walk Cabo Roig Marina, I noticed a military facility with the writing over the red door “TODO POR LA PATRIA” and beneath it Destacamento TTE Morejón. When I returned home I was able to find after a long search on the web that there was a detachment facility base of Special Operations of the Army (the 'water phase') ie exercises diving, canoeing and sea-related activities called 'Lieutenant Morejon', in honour of a soldier who watched a boat was heading out of control after its crew had fallen overboard. The boat hit him, but he managed to survive. 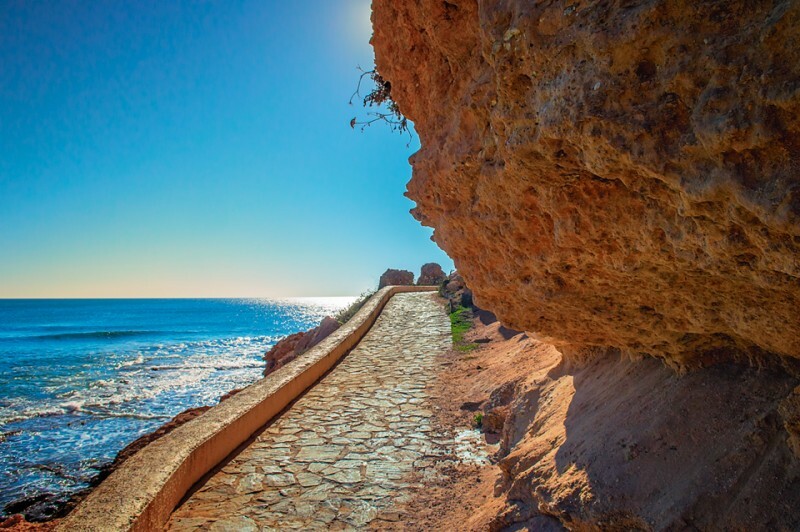 Soon after that there is a short stretch of the path with tiled walls, and looking up you cannot miss the Cabo Roig Watchtower. This tower dates back to the sixteenth century, it was constructed (as many were along this coast) to warn local inhabitants of pirate attacks in more violent times past. 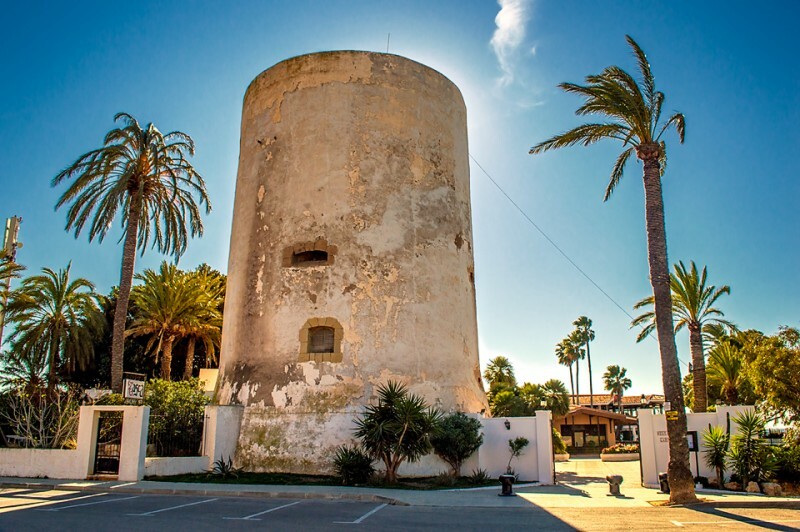 The watchtower is now part of a restaurant complex (Restaurante Cabo Roig Tower) which overlooks Cabo Roig Marina. 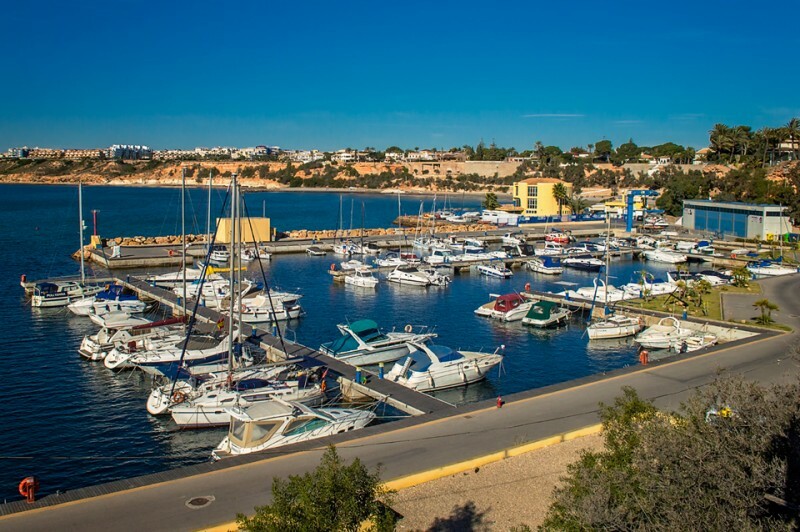 The Cabo Roig Marina is located in an attractive area it has over two hundred mooring spaces. Even though it was mid February, it was hot. I would not recommend that if you do this walk during the hotter months, take a hat, water and suntan lotion, as there is not much shade and can get very hot along the way. As it was a clear day we could see La Manga off in the distance from Cabo Roig. 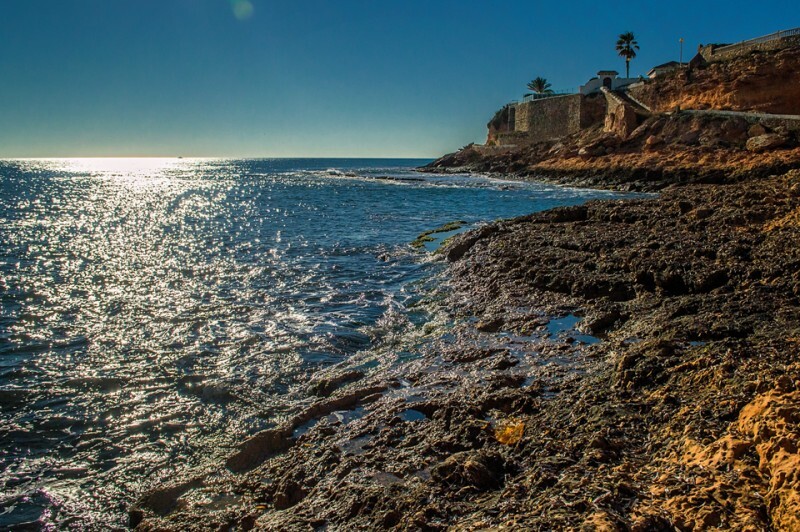 The coastal walk La Zenia to Cabo Roig offered some picturesque views of the sea and coastline and there were some interesting coves along the way.